If you missed our first case study, click here; as I believe both stocks has further upside. Our second case study discusses our $BIDU trade. As with a majority of all our trades, you can expect to enter profit territory almost immediately (I seek the best entries). But overall; we wait a few days to a few short weeks for our first target to materialize. 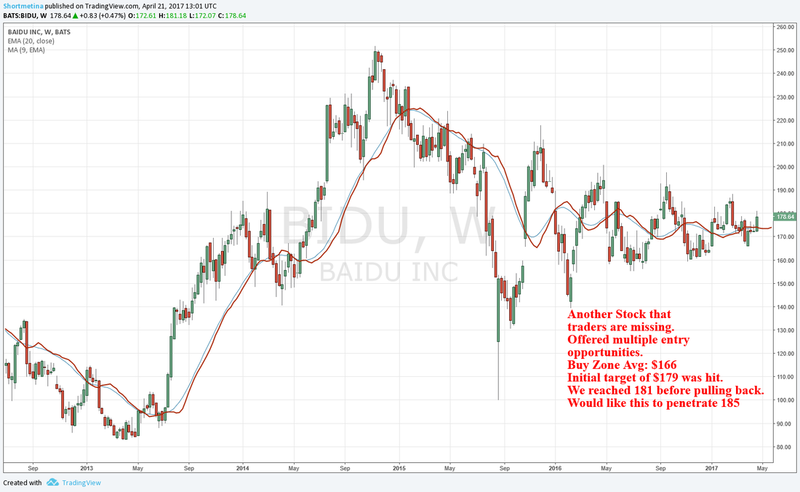 In the case of Baidu ($BIDU). We saw the stock go from our avg entry* of 166 to a high of $181.18 in a few short weeks. If you do the math; that's an extra $15 for every share owned. I don't believe BIDU's move is complete as of yet; there's a possibility of more upside. Take a look at the chart below. Upcoming French Election (4/23/2017) this weekend can potentially have an affect on your portfolio; ensure you're positioned well.